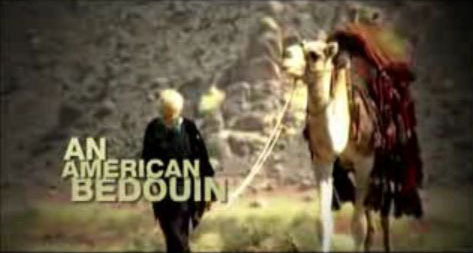 Screen Shot of "American Bedouin"
According to an excellent 2007 Aljazeera Feature video, Erga Rehns has been living the life of a Bedouin in the desert with the Bedouin tribes of Wadi Rum for seven years. I’m not sure if she still does though. I’ll have to do more research in order to contact her again. The last, (and first) time I saw her in person was in 1981, when we first met at her little art studio and home in Obidos, Portugal. Some people are lucky enough to be a primed for a turning point in their young lives, and come across just the right person at the right time that poses questions, and challenges one’s view of the world – who plants the seed for a paradigm shift. Most people aren’t’ aware they’re ready for that change, until years later, when they realize the shift was primed by those mentors. Erga is that person for me. I was fresh out of college, wrapping up my Euro-train trip, making a swing through Portugal, before heading to work in the world famous ski town of Lech Austria at Martin Strolz’s ski boot store and factory. I was a 21 years old, ready to make my mark on the skiboot industry. Hopefully a job in Mr. Strolz’s business would help further my career. I lived ski boots. Everything about them I devoured: fitting, manufacture, the parts, marketing, the business culture. My internship at the University of Utah even focused around skiboot manufacturing. 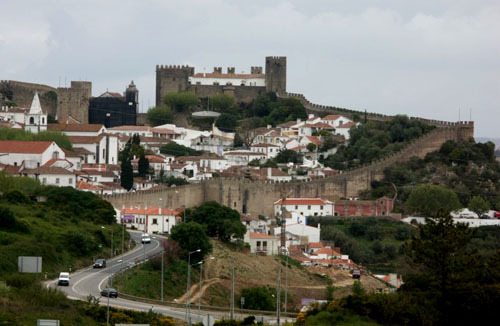 I got off the train with my backpack, and starting walking towards the walled Moorish castle village of *Obidos. As I crossed a bridge, a shorter man, a bit plump if I remember, with a full black beard and Portuguese fishing cap leaned against the railing, puffing on a long pipe. “Ah,” I thought, “The epitome of the Portugese villager”. He took me into a little room filled with wood carvings and pottery, and other works which completely covered the walls of the dining room/kitchen. Erga was in the room and greeted me with only a smile and a jesture to sit down. The man slowly leaned on his elbows at the table, puffed his pipe, and asked, “Where from, Where from? View from near Erga's worskhop/apt. That was the start to an amazing weekend. I sat with Erga and her then partner Luciano Cappella, for hours on end talking about life. It turns out the two left the states, fed up with the materialistic and imperialistic ways of a post-modern society. Although the two were brought up in the US, Erga was born and spent her earliest years in Jordon, while Luciano had roots in Sicily. Our discussions ranged from the “American mindset”, to war, raising a family, poverty, consumption and consumerism, the environment and beyond. Beneath it all, was the theme of simplicity and not living with more than one needs. So I wasn’t surprised, when I Google’d Erga, to learn of her life as a Bedouin in the desert. I stumbled upon the Aljazeera video on YouTube. When it started, I couldn’t tell whether it was her or not, it had been thirty years. But when I closed my eyes, and heard her voice, I knew it was her. The camera zoomed in on a journal she was writing, and I recognized the handwriting from the years of letters I’d received from her. In an unusual twist, my mom once came back from Alta, Utah, on one of the rare visits when she had been there when I wasn’t. I must have been in another part of the world; it was during the late eighties or early nineties. She somehow came to know Jeanne Pickett who worked at Alta’s main office. When I crossed paths again with my mom back in New Hampshire, she said, “You and Jeanne have a mutual friend, and you’ll never guess who that is!” I kept trying to guess until finally she mentioned Erga. It turned out that Jeanne had been on vacation in Portugal, met Erga, and became good friends, and had been back numerous times. I corresponded with Erga a few times since, and even received a piece of blown glass artwork by post from her. 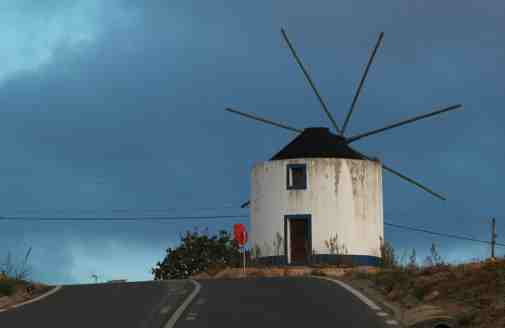 At that time she was living in a windmill in Obidos. Where Erga is, God only knows. Maybe someone reading this blog will put me in touch with her. I think the time for re-connecting with my friend, that helped me set some wheels in motion, changing my life, is long overdue. After that weekend of ideas with Erga and Luciano, I did start work for Strolz Boots, and really got into ski boot manufacturing. Then one day, in the factory in **Klausen, Italy, something snapped. I realized I needed to make a change from the corporate ski business. I started climbing more, and eventually became an international guide and wilderness experiential education instructor, which led me to founding Mountain Spirit Institute. I think it just took time, like a spinning wheel that has certain momentum, for the ski business wheel to slow down, and the ideas discussed with Erga and Luciano to incubate and finally break out of their shell. I’ve been at peace with that change of course ever since, and have never looked back. Thank you, Erga. I look forward to getting in contact with you again, somehow! *Obidos is a World Heritage site. **Klausen, also called Chiusa, its orginal Italian name, is a small village on the Brenner Autobahn in Sud-Tirol, of Northern Italy. This entry was posted on 05/07/2009 at 00:26 and is filed under Conservation, Environment, Film/DVD, Holistic Living, Inner Work, Inspirational People, Leadership, Power of Place, Spiritual, Sustainable Living/Communities, Traveling. You can follow any responses to this entry through the RSS 2.0 feed. You can leave a response, or trackback from your own site. Depends in what country you’re in. Let me know.. I am Erga’s first cousin. Could probably put u in touch with her sons. Hi Alice, Thanks for contacting me.. good to get your message. I’ll send you an email. I just came across your article. I’m Erga’s son Neil Alexander, a musician living in the Hudson Valley NY. I’m in touch with her pretty regularly. Alice, please feel free to get in touch with me. Would be great to connect. Thanks for the message, and glad you liked the post on your mom. yep, that’s just how it all happened. I look forward to connecting and will visit your website in the meantime. IM WORKING ON REVITALISING THE GLASS ART WORLD IN mARINHA grANDE IN pORTUGAL, AND IT LOOKS LIKE GO ILL BE A PART OF GLASS aRT sTUDIO ,IDESIGNED THE PROJECT, AND WILL IOVE IN Portugal again, PLEASE WRITE TO ME. THE UNIVERSE IS SMALLER THAN WE THINK.